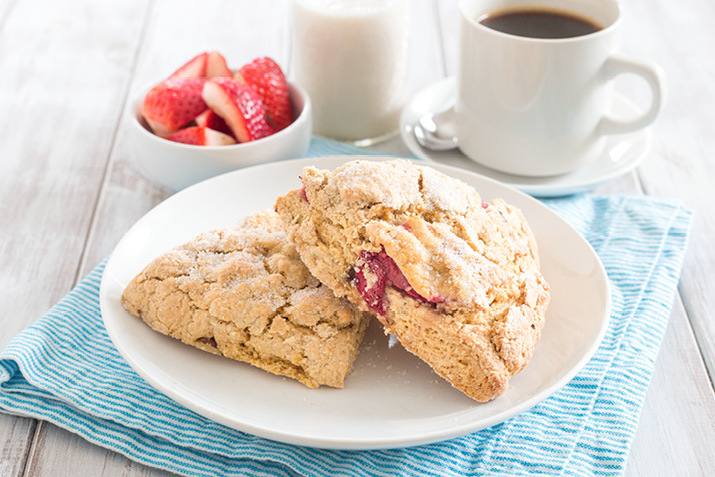 Take a moment for yourself with these tender, buttery whole grain scones speckled with sweet, juicy berries and crunchy nuts. Heat oven to 400°F. Line a baking sheet with parchment or coat with vegetable oil spray. In a large bowl whisk the flour, sugar, baking powder, baking soda and salt. Cut chilled butter into cubes and work the butter into the flour mixture quickly with your fingers or a pastry blender until the mixture is crumbly but small chunks of butter remain. In a small bowl, whisk the egg, yogurt and vanilla; mix well. Make a well in the dry mixture and pour in the wet, stir just until mixed, then stir in walnuts. Place half the dough on a floured counter or breadboard and shape into a circle 8 inches across, then cover with halved strawberries. Crumble the remaining dough over the strawberries and pat to cover, and form a disk about 3/4-inch thick. Sprinkle with sugar and pat to adhere. Use a knife to slice like a pie into 8 wedges. Place each wedge onto the sheet pan with at least 1 inch between them. Bake for 15 to 20 minutes, until golden. Transfer scones to a wire rack to cool. Serve warm, or cool completely and store, tightly covered, for up to 4 days at room temperature. Served with a touch of butter or a drizzle of honey, fresh-baked scones are the perfect companion to a cup of coffee or tea.